I found these tasty treats in the supermarket a while ago. 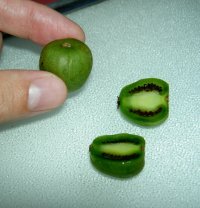 I never really enjoyed the larger kiwifruit (known as the “kiwi” in some parts of the world, which amuses us New Zealanders no end), but these little ones are great. I fondly remember the Potato and Bacon Pies from when I went to McDonald’s in Tokyo in 1992. I’m happy to see that they still have lots of unusual items available. The Korean barbecue beef burger was probably the best, but the curry pies they have now are pretty yummy, as is the tofu burger. If you’re vegetarian, don’t get excited – I am told that the tofu burger also contains chicken. They don’t really “do” vegetarianism in Japan. At the same restaurant in Sasebo where we ate live fish, we were treated to some fugu, the famous blowfish that is supposedly fatal if incorrectly prepared. It was good, with an exquisite texture, and there were no ill effects (except to the poor fish). We were taken to a very nice restaurant during the new year. Among the many delicacies we had were a fish that had been freshly filleted and turned into sushi. The rest of the fish was artfully arranged on the serving plate. It was still twitching. On the next plate was a similarly spasmodic squid. Both were delicious. I tried a bit of whale at somebody’s house at new year. It was nice enough, if a bit chewy, but it seemed odd eating whale (even thought it was presumably killed purely for scientific research purposes). All my life I have thought of whales as things to be saved, not served. Curry-filled donuts (or doughnuts) are a surprisingly popular snack in Japan. They are available everywhere from local bakeries to Starbucks, and they taste as good as they sound.